I have spent the last few weekends preparing vegan dishes for Passover. What do you make the morning after? Matzo brei! I tried it with tofu two different ways but it was just too much tofu. I like tofu when it looks like tofu not as a filler. Nava Atlas (of vegkitchen.com) and quinoa flakes may be my two new best friends. The quinoa flkes worked great in the matzo balls and just as great in the brei. 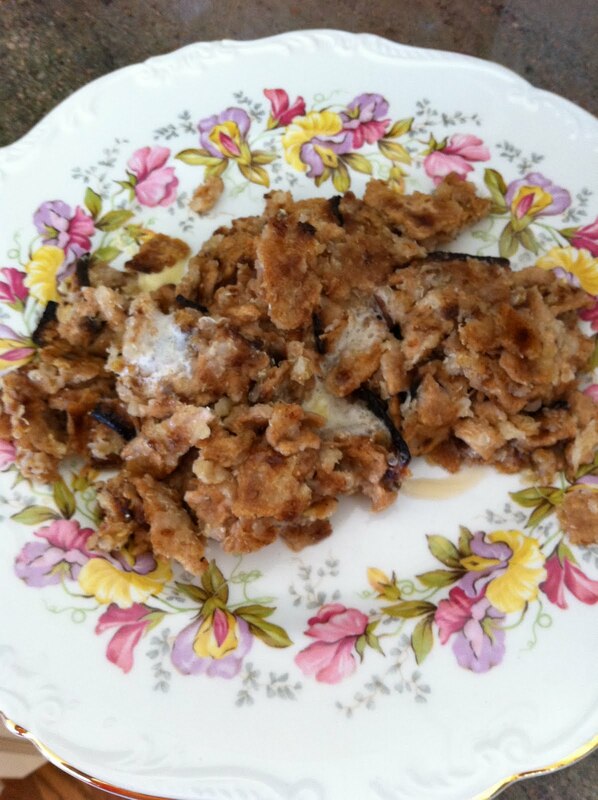 It tastes just like the matzo brei my Grandpa Abe made during passover when we were little. Lots of matzo, not so much brei! Here is Nava’s recipe. It makes one serving. I made it slightly differenly than the way Nava has it listed on her site. Here is what I did. Boil the water. In a bowl, mix the crumbled matzo and the quinoa flakes. Pour the hot water over it and let it sit for 3 to 4 minutes. It is ready when the water is absorbed. In a skillet, melt some Earth Balance and pour the mixture in. Sort of flatten it down a little and sprinkle it with a little salt. When it has been going for a few minutes, scramble it a little to give all sides a chance to crisp up. It doesn’t take too long; you will see the consistency you want. When it is done, serve it with a few pats of Earth Balance, a dash of salt, and covered in maple syrup!